Dynamic workspaces provide maximum translation flexibility and minimize long-term maintenance of workspaces. Dynamic means that the workspace is set up very simply, but with maximum flexibility. You can read any source dataset (of the chosen format), and it will be read and written (to the destination format) correctly. The important part is that you can change the source to a different dataset, and it will still work. Traditional FME Workspaces are tightly bound to the source and destination schemas. In many cases, this is what you want. However, in certain situations, the workspace needs to be more independent of the schemas. When a relatively simple data transformation can apply to all the data regardless of schema (that is, clipping, coordinate transformation). When the source schema is not predictable or well-defined. When the destination format might vary. Long-term maintenance of the workspace is required. While translations are generally very easy to implement using FME Workbench, in the longer term they may require a lot of maintenance to keep up-to-date. If new feature types or attributes are added to the source data, you must also update the workspace. Sometimes you may not even realize that a data owner has changed their data schema. A workspace that reads any set of feature types from a source dataset. This is supported by the Merge Filter and Adding a Reader as a Resource. A workspace that reads any set of feature types from a source dataset, and writes a corresponding set of feature types. A workspace that reads any set of attributes on the source feature types and writes them out in the same schema. A workspace that writes to any format, without the need to add multiple writers. This is supported by the Generic Writer. In most cases, you can use the default schema properties of the dynamic writer. However, there are some parameters you can adjust. 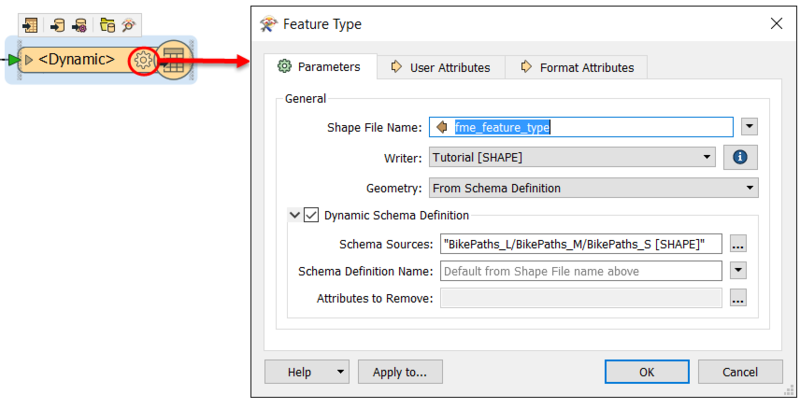 To display dynamic schema parameters, open the writer Feature Type dialog. See Editing Writer Feature Types. To view, check the Dynamic Schema Definition box. Schema Sources: Click the Browse button to select from a list of existing schema readers. Only the readers that you have selected will be used at runtime. If Schema from Schema Feature is selected, the writer checks the first feature for the presence of a specific type of list attribute that provides schema information. If this list is found on the first feature, it can be used to generate the output schema for the writer. For more information, see Deriving Destination Schema from Schema Feature.